In today's post I'm going to show you three gorgeous rings I received from HW Star Jewelry, which I will be reviewing and showing you more of them in the upcoming Nail Art & Jewelry posts on the blog. I wanted to start with a general review of the rings and the shop, and since there is also a giveaway for one of these rings, I decided to do this post a bit different this time. I came across HW Star on Etsy and I really liked their jewelry. I love the simple and clean lines of their designs, and their druzy stone jewelry were so beautiful that I instantly fell in love with them. I was really excited when they accepted my offer for collaboration, and so I got to share these lovely rings with you. HW Star is a small and upcoming jewelry store based in Thailand, managed by two partners - Rujipa and Wit. Together they are running this lovely store and creating beautiful handmade jewelry. Their designs are very minimalistic, yet beautiful in their simplicity. HW Star jewelry are handcrafted of sterling silver, combined with beautiful opal and druzy stones, which are put together into an interesting and unique designs. Find more about HW Star here. 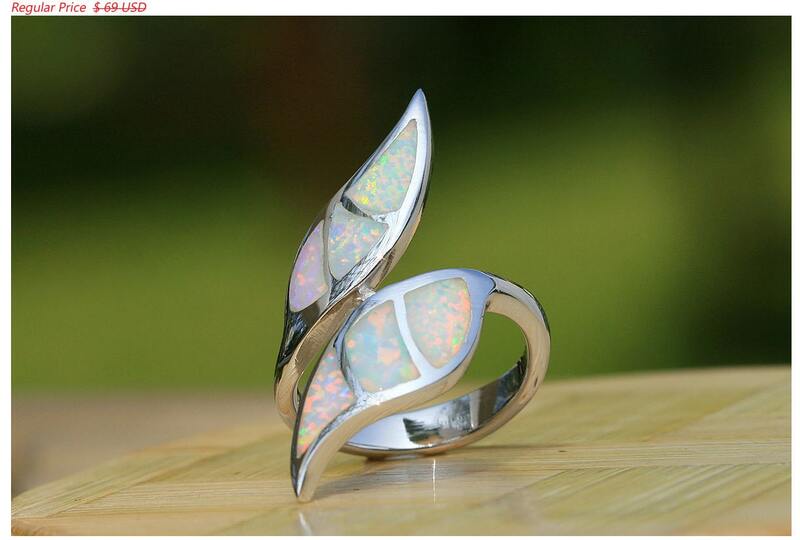 The first ring I want to show you is the Inlaid Opal Ring, which is shown above. This ring is made of sterling silver and lab created white opal. The design is clean, simple and very beautiful in my opinion. The light hits the opal differently each time, bringing out various colors. It's a beautiful and well handcrafted piece with an unique design, which I'm really happy to have in my jewelry collection. HW Star have various ring designs with white and blue opal, they are all very interesting and beautiful, you can take a look at them here. 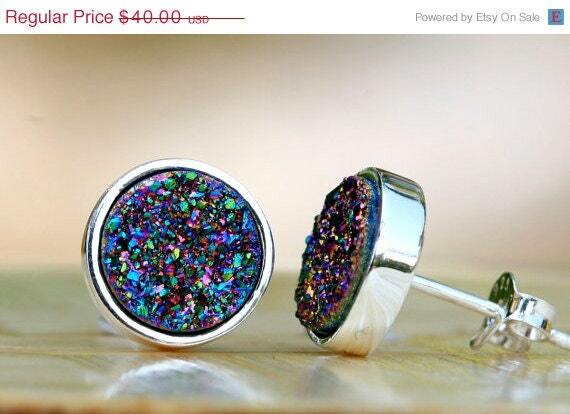 Next is the oval Peacock Druzy Ring, it has a gorgeous multicolored sparkly effect. 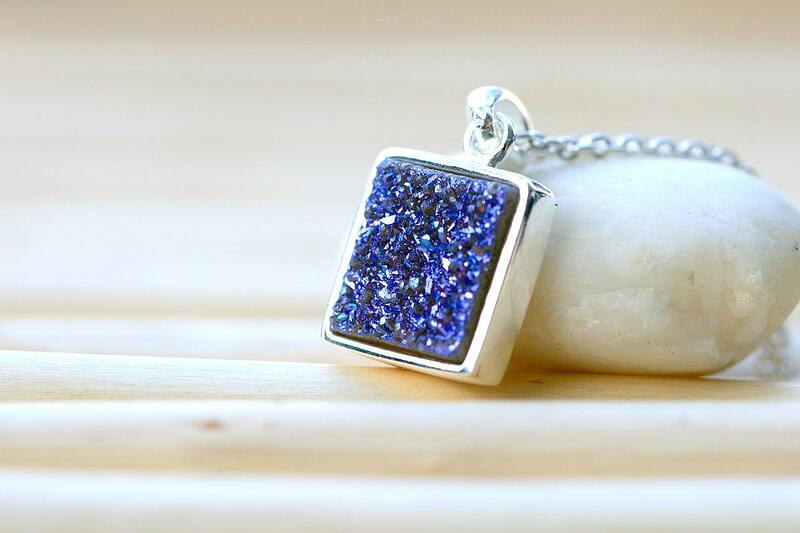 The druzy stone is set in a shiny sterling silver band. This is a very simple yet a beautiful design. 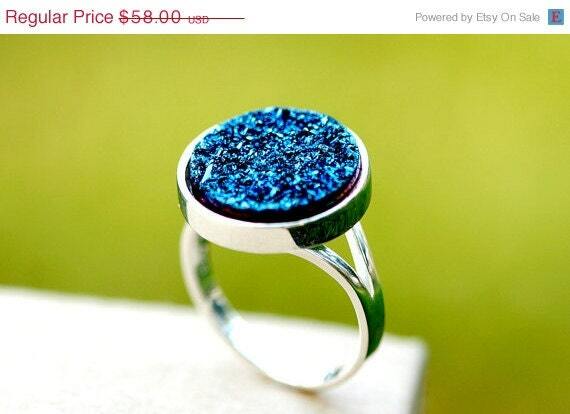 So I guess if textured nail polish is the latest trend, I don't see a reason why druzy rings shouldn't be as well. I am completely obsessed with the druzy stones, they are so sparkly! The last but not least is the Silver Druzy Ring, it's very similar to the ring above only it's rounded and a bit smaller, which makes this ring even more delicate. It's also very sparkly and beautiful, and I really love using it for stacking with other rings. If you liked this ring too, you will be happy to know that HW Star are giving away this ring to one of my readers! The rings I showed you in this post will be featured in my next Nail Art & Jewelry posts, so I hope I got you curious about them and that you are already guessing what nail art designs I will be creating to match these beautiful rings. Be sure to stop by HW Star shop to see their lovely jewelry. They are currently having a sale for Valentines Day, so it's a perfect time to spoil yourself with a new jewelry piece. Don't forget to use the special 15% off coupon code when you are placing and order at their store. It's giveaway time! Did you like HW Star Jewelry? Here you get the chance to win one of their most popular rings. In this giveaway you can win a beautiful silver coin druzy ring of your choice from the selection that HW Star offers. Giveaway open worldwide and will end on February 8. Very beautiful!!! Thanks for this opportunity!!! I love it! I hope I win! I think it is ;) I've sent an email to the winner, better check yours!